Tench deserves credit for the formation of the band. He played with Petty and the Heartbreakers' lead guitarist, Mike Campbell, in a band called Mudcrutch, and when they broke up he had a friend smuggle him into a studio to record some of his own material. The musicians he chose for those sessions included Campbell and Heartbreakers Stan Lynch on drums and Ron Blair on bass. It wasn't long before the platinum blond Petty was back in their lives. "I called Tommy up and said, 'If you're bored, we need a helping hand,'" Tench said. "He liked the band and bam!" The new fellowship was rushed into the studio for "Tom Petty and the Heartbreakers," which spawned a Top 40 hit, "Breakdown." 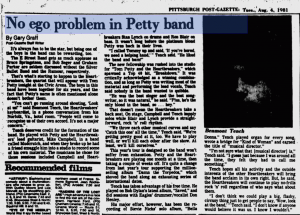 It was critically acknowledged as a winning combination and as long as Petty was writing most of the material and performing the lead vocals, Tench said nobody in the band wanted to quibble. "He was the best singer and the best songwriter, so it was natural," he said. "Plus he's the only blond in the band, so ... hey." That doesn't mean the Heartbreakers take a back seat. On stage, Campbell and Tench supply solos while Blair and Lynch provide a straight-forward, rock 'n' roll rhythm. "We throw each other musical curves and say 'Catch this one' all the time," Tench said. "We're getting pretty good at it, too. We have to play well, or we'll kill each other after the show. At least, we'll kill ourselves." This year's your is designed so the band won't suffer from exhaustion. Petty and the Heartbreakers are playing one month at a time, then taking a couple of weeks off. It's quite a change from last year's tour supporting the million-selling album "Damn the Torpedoes," which shoved the band along an exhausting series of international dates. Tench has taken advantage of his free time. He played on Bob Dylan's latest album, "Saved," and did sessions with Eagles drummer/vocalist Don Henley. His major effort, however, has been the recording of Stevie Nicks' solo album, "Bella Donna." Tench played organ for every song, wrote a bridge for "Kind of Woman" and earned the title of "musical director." "I'm not sure what that [musical director] is," Tench said. "I guess just because I was around all the time, they felt they had to call me something." Tench hopes all his activity and the outside interests of the other Heartbreakers will bring the band acclaim in its own right, But, he said, the Heartbreakers will continue to play no-frills rock 'n' roll regardless of who says what about them. 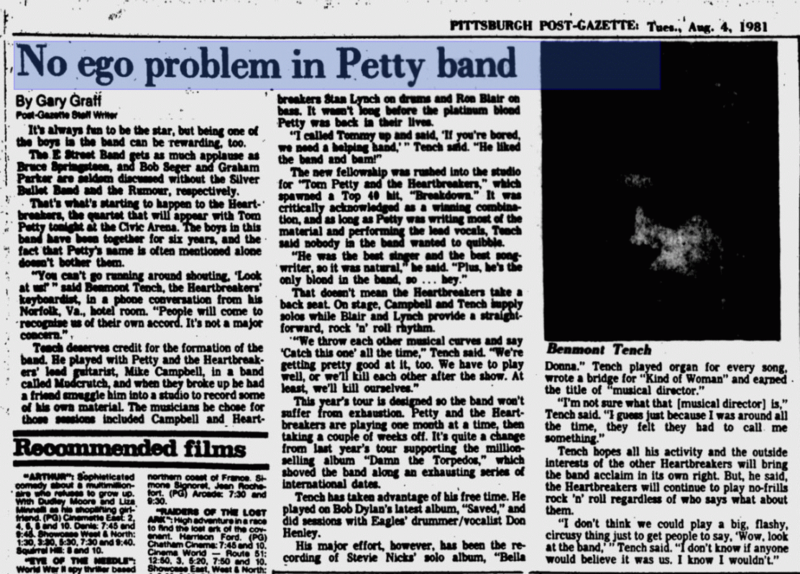 "I don't think we could play a big, flashy, circusy thing just to get people to say, 'Wow, look at the band,'" Tench said. "I don't know if anyone would believe it was us. I know I wouldn't."